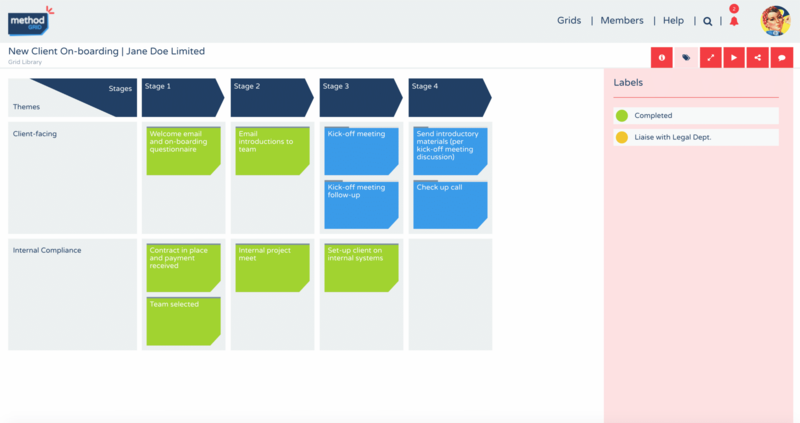 Our new (version 05) release introduces progress tracking (checklists) to Method Grid! 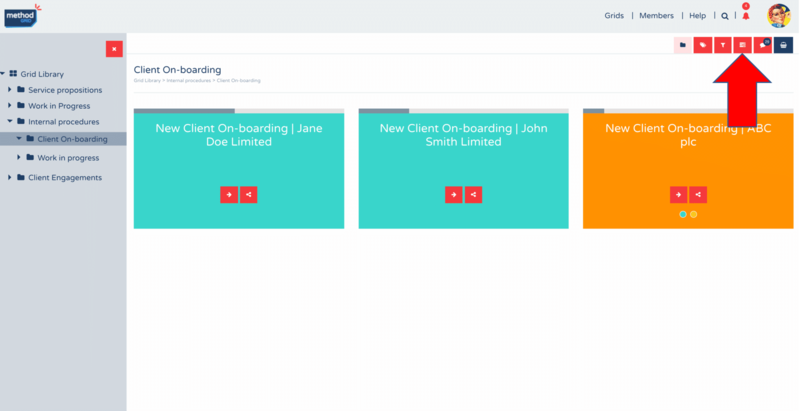 This fundamental upgrade means that Method Grid is more than just the home for your company’s operating playbook; now, it is also a solution for tracking and managing workflow progress through your best-practice grids. From the moment we saw many of you cloning master grids into actual instances of a grid’s delivery and then manually labelling elements to track workflow through a grid – we realised that Method Grid was far more than just a central home for repeatable, best-practice reference. 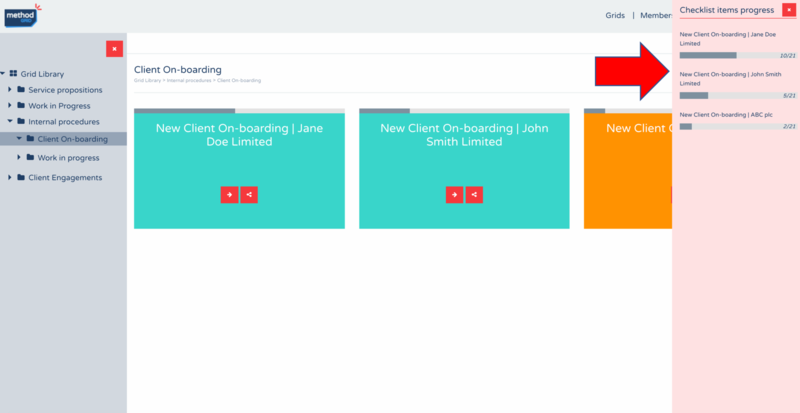 It was also your solution for best-practice workflow management and tracking! As such, and in conversation with many of you (a huge thanks to all who took the time), this logically led to the request for checklists within grid elements. We are excited to say this is all now live and – we feel – takes the Method Grid solution to a whole new level. 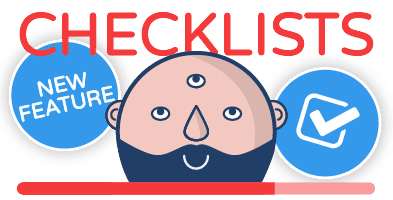 What is the main use/benefit of checklists? Now, with grids that capture workflow tasks (e.g. project delivery, staff induction, client on-boarding etc.) 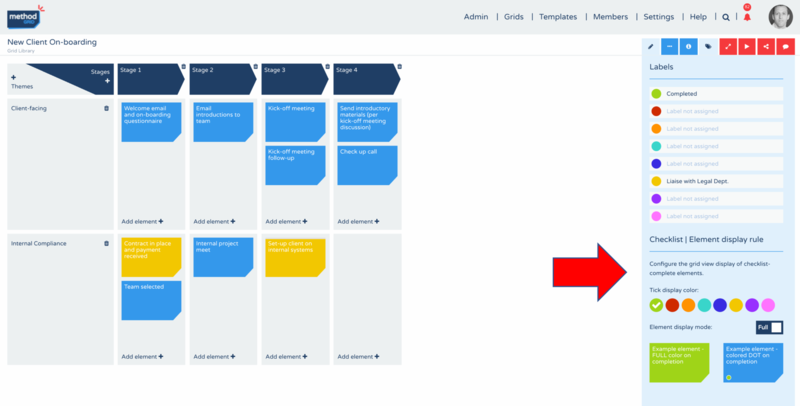 you can clone your (forever-improving) master grids into specific instances in order to logically tick-your-way through an easy-to-follow workflow schematic. 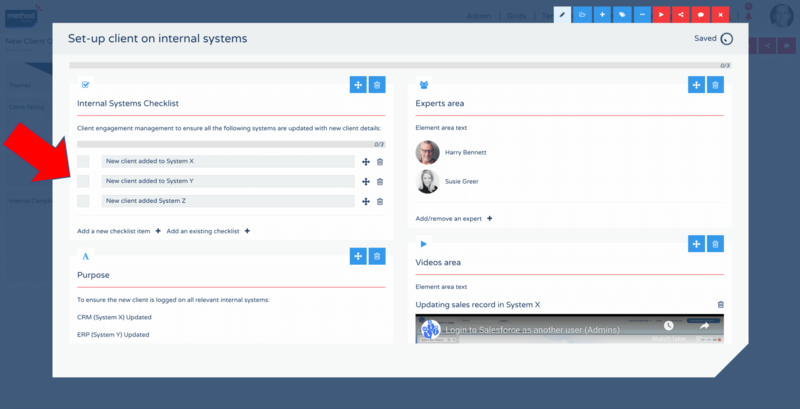 Elements were always able to capture a rich array of information/guidance/tools to help you undertake a certain methodological step; now they can also help you work-manage and progress-track. The ability to configure simple element-checklist-complete formatting rules – for example, to turn an element green when all of the contained checklist items are complete – introduces a simple, yet powerful, graphical overlay of progress at the grid (overall methodology/procedure) level. To find out more about this major new release, the following video talks through all the key new features – else you can read on below. What new (checklist) features have we introduced? 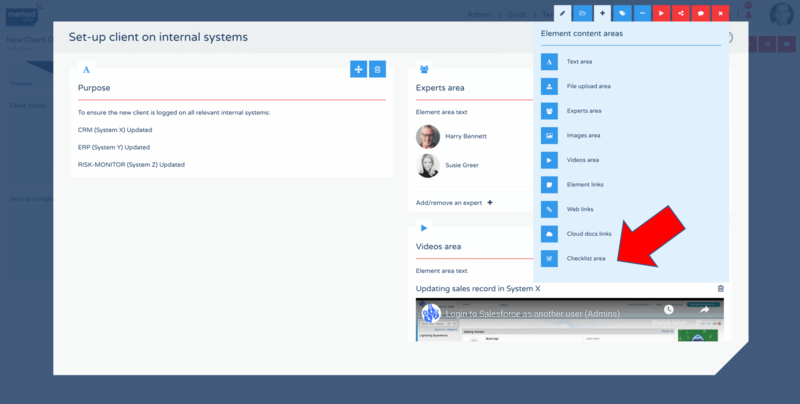 Now, within the element builder, architects and builders can add a checklist area (or multiple checklist areas) to an element – by clicking on the “add element content areas” action button (“+”) in the element builder action button panel and selecting “Checklist area”. Like all other content areas, they can then be placed (using the blue drag-drop action button) in any position. Within a checklist area, an architect or builder can add checklist items by clicking “Add a new checklist item +” and typing in the new task description. You might just want to add a simple, single “Element completed” checklist item or, as in the example below, a series of related steps. 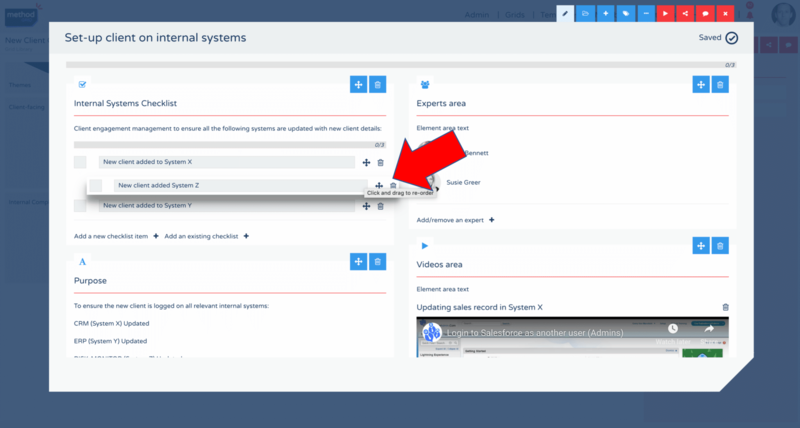 It is also possible to import a previously developed checklist from another element by clicking on “Add an existing checklist +” and selecting from the dropdown list (presented by grid name | element name | checklist area name). Once checklist items are created, they can be re-arranged and deleted using the action icons to the right of the checklist item. To move a checklist item simply click-hold the drag-drop (“cross hair”) action icon and drag-drop to the desired new placement (within the same checklist content area). The real power of checklists comes at the summary grid level. Within the label dropdown, an architect or builder (in edit mode) can now configure various element display rules to facilitate the easy tracking of workflow progress. For example, as per the example below, by selecting a checklist-complete display color (green chosen) in FULL mode (the default) – any element within this grid that has all its checklist items completed – will be displayed as a green element thumbnail. This rule can be turned off (untick the color), changed (click another color) or moved from FULL mode to DOT mode. In FULL mode, a completed element thumbnail displays as the selected color. In DOT mode, a completed element displays the colored dot on the element thumbnail. The real power of this new release comes in the user experience of working through a grid that contains checklists, and, checklist-complete element display rules. 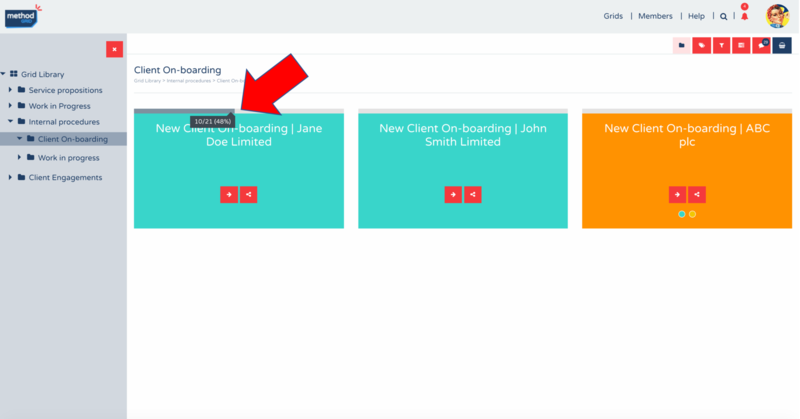 Typically, a master grid (say, your “New client on-boarding” grid) is cloned, and renamed, into an actual instance of delivery (say, “Client on-boarding | John Smith Limited”). See FAQ for more on grid cloning. 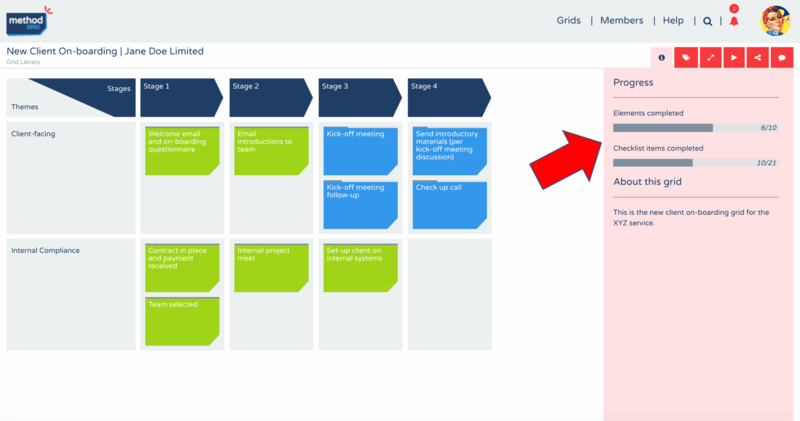 Within this new grid, any member of your Method Grid domain can then work their way through all checklist items contained within elements – by simply clicking on the checklist item box (to the left of checklist item) to show as complete (box ticked and checklist item striked-through). Similarly, checklist items can be un-ticked. In summary, this has been a major release for us here at Method Grid HQ and we hope it has taken the value of the solution up another notch for our community of users. As always, whilst this has been subject to major testing, we would really value – commensurate with the scale of this new release – all feedback (especially so if you discover any yet undiscovered glitches). Thanks again to everyone who helped invoke and shape this exciting new set of features!